Proximion design and produce complete temperature monitoring systems including interrogator and analysis software. We have a special interest in measurements in harsh environments at high temperatures. Our fiber optic plattform based on Fiber Bragg Grating (FBG) technology has the ability to significantly enhance performance, productivity and safety in numerous industries. The systems unprecedented sensor density together with extreme resolution and sample rate will provide you with insights you never thought were possible. Take the opportunity to master your industry. Small form factor. 800 µm steel tube diameter, any length. High temperature operation. Long term stability in up to 600°C. High spatial resolution. Any distance, standard spacing 5 mm. Fast response time. No more than 70 ms thermal constant. High reflectivity. Transform limited fiber optic sensor design. Customized Design. Any sensor array length, any wavelength. Rugged. Hermetic steel package, harsh environment connectors. Video demonstrating the ultra-fast Wistsense interrogator. WISTSense is an ultra-fast industrial grade FBG-interrogator providing measurement of approximately 1,000 sensors per device. The interrogator is ideal for distributed temperature sensing in numerous industries such as: Oil & Gas, Aerospace and heavy industry. Without using any moving parts WistSense is extremely reliable for long term field operation. WistSense in combination with Proximion’s sensing analysis software - WistSenseMonitor will provide complete data acquisition, computation and analysis of all your fiber optical sensors in real-time. The need for distributed sensing exists everywhere; Industrial & automation, energy, telecommunication, aerospace, automotive, security & defense and medical, just to name a few. Our history within fiber optics dates back to the mid 90s. Over the years we have developed unique expertise within design and development of fiber optic sensor systems for various applications. Proximion is not only the manufacturer of the world's by far longest continuous FBGs, we also manufacture state of the art FBG-interrogators and sensor packaging. In fact, everything from development to design and manufacturing is conducted at our premises in Kista, Sweden. Our ambition is to always deliver cutting-edge solutions to our customers. This is achieved by our unique ability to precisely tailor the markets most advanced fiber Bragg grating sensors, packaging and FBG-interrogators. The fiber optic sensor design always originates from the customer's specific application and environment. In order not to only deliver innovative solutions but also protect our customers we do not disclose details of applications and distributed temperature sensing solutions delivered. However, here we can proudly present some technical data from a recent case in order to illustrate our capability within advanced fiber optic sensor systems. Optical sensors and especially FBG-based ones provide an attractive alternative to traditional electrical sensors for many applications. They have the advantages of high accuracy, long term stability, streamlined installation, and premium performance under harsh environmental conditions. Because optical fiber is essentially a passive, mechanical component of a fiber optic sensor system, it contains neither moving parts nor electrical circuitry and is therefore completely immune to all forms of electrical interference and have extraordinary resistance to mechanical fatigue. High multiplexing capability. 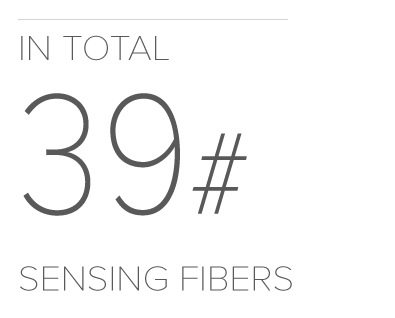 A fiber optic sensor system may contain many fibers where each fiber may contain many FBG sensors. Immune to interference from electromagnetic fields and do not electrically disturb other devices. High temperature, high voltage, dust, vibrations and explosive environments. Intrinsically safe. No electricity at the sensor allowing for use in the most hazardous environments. Extremely small and light-weight. Thinner than a human hair and lighter than you can imagine. The basic principle of measuring temperature with Fiber Bragg Gratings (FBGs) is that the reflected wavelength depends on the grating characteristics (period, modulation) and is influenced by the ambient conditions such as strain and temperature. This allows the utilisations of FBGs as sensor for strain and temperature. In the case of temperature monitoring the Bragg wavelength is a function of the temperature. This temperature dependence results from changes of the refractive index of the fiber as well as from thermal expansion of the glass material.